When I shared these mini Kahlua cupcakes couple weeks ago, I learned that you all love Kahlua! I don’t blame ya, boozy treats are the best! 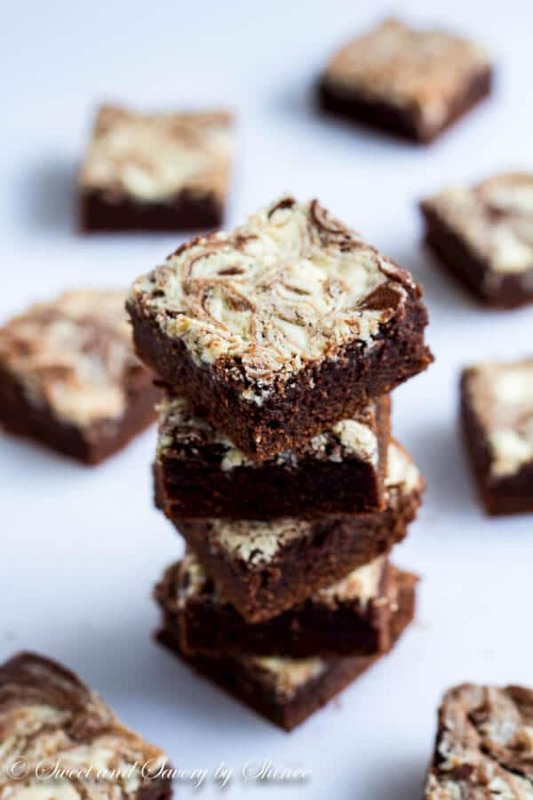 🙂 These brownies are ultimate dream for any chocoholics out there because they’re loaded with 3 types of chocolates: semi-sweet chocolates, cocoa powder and white chocolates. Yummy, if you ask me! 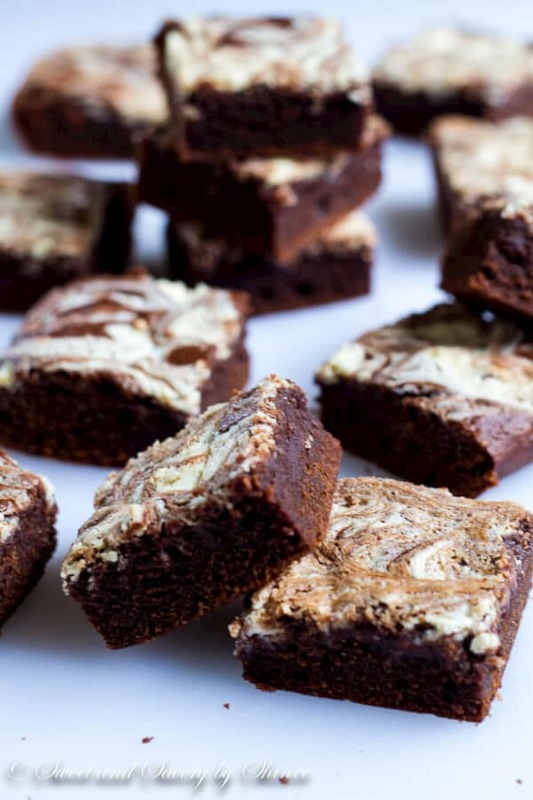 These brownies are fudgy and rich, just the way I like it. Kahlua subtly comes through the rich chocolates in every bite. It’s essential to use high quality chocolates in this recipe, as the quality of chocolates directly correlates with final result. Semi-sweet chocolates were my favorite, yet bittersweet was not bad as well. I used natural high fat cocoa, the richest grade of cocoa out there. It brings out rich chocolate flavor beautifully. 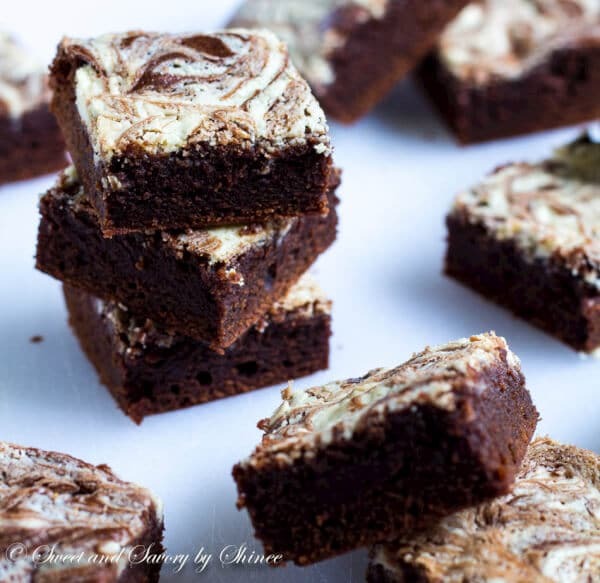 And topped with sweet white chocolate, these brownies are truly delightful treat. Don’t let the fancy swirled look discourage you to try this recipe. My step-by-step photos below prove how easy it is to create the beautiful design. Swirling is my favorite step! There is no way to mess up this step. Reminds me of nail designs I used to make on my nails when I was in high school. 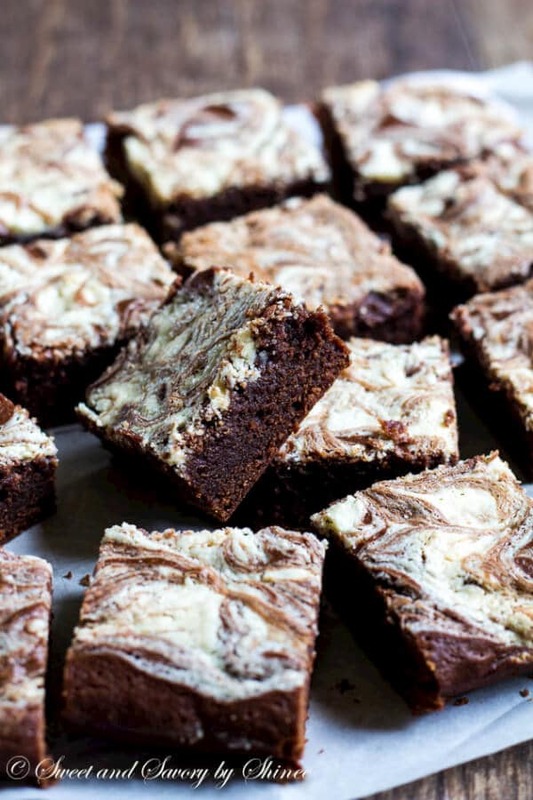 Now if you love chocolate and Kahlua, you have to make these delicious brownies. 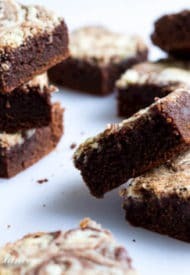 You will thank me as you bite in to these irresistibly rich and decadent treats. You’re welcome. 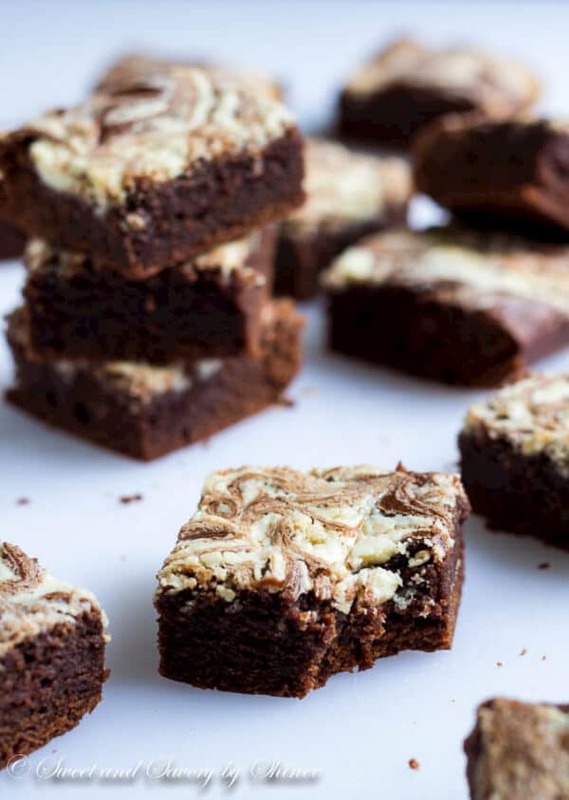 Loaded with 3 different chocolates and chocolate liquor, these triple chocolate Kahlua brownies are chocoholic’s ultimate dream! 1. Preheat the oven to 400 degrees F (200 degrees C). Line 8x8in baking pan with parchment paper. 2. 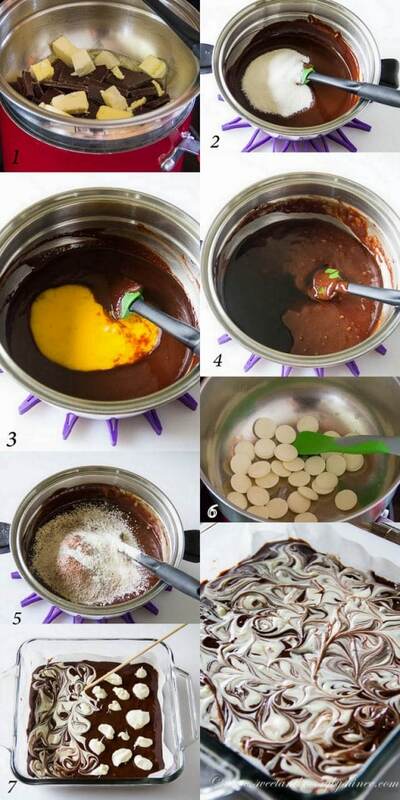 In double boiler, melt the chocolate and butter over simmering water (not boiling!) stirring occasionally until smooth. Cool for 5 minutes. 3. Stir in the sugar, eggs and Kahlua stirring well after each addition. Sift the flour and cocoa over the chocolate mixture and stir until just combined. Pour the mixture into the prepared pan. 4. In double boiler, melt the white chocolate chips over simmering water (not boiling!) until smooth. Spoon the white chocolate mixture on the chocolate mixture. Using a wooden skewer, or toothpick, swirl the white chocolate into the batter. Bake for 15-18 minutes, or until the inserted toothpick comes out clean. 5. Let the brownies cool completely before removing from the pan. Remove pan and cut into 12-16 square.